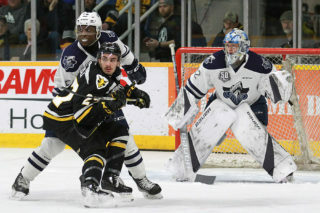 While fans in Cape Breton already know his name, Mathias Laferrière hopes that getting drafted by St. Louis is just the beginning. The 6’1 forward was selected by the Blues with the 169th draft pick in the sixth round of the NHL draft this June. 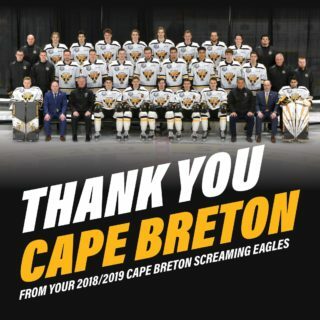 Since then, it’s been full speed ahead for the 2018-19 season and the rest of his hockey career for the Screaming Eagles centre. Like most NHL draft choices, getting chosen into big league wasn’t the first time Laferrière had his name called at an entry draft. Before his trade to Cape Breton, the Montréal native was picked by Blainville-Boisbriand in the first round at 7th overall in 2016. 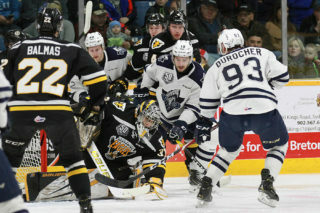 During his QMJHL draft year in midget, “Laffy” captured the MVP award at the Telus Cup (the national midget championship) playing against players two years his senior. In his first full season in the QMJHL in 2017-18, Cape Breton’s #81 collected 41 points through 67 games. “Training there has really showed me how to behave as a athlete,” says Laferrière. 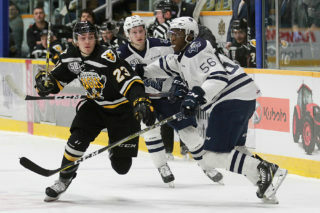 The former Lac St-Louis midget standout has used his summer regiment as a way to build off the “huge boost in confidence” from being drafted in the NHL, and feels similarly confident in the Cape Breton team he plays for in regards to the upcoming campaign.